Into Day Four of British Pie Week and there were still plenty more pies for us Pierateers to get our teeth into! Following 15 pies on Day One, another 13 and a half on Day Two and 16 and a half on Day Three, how would they fair on Day Four? And how did you get on? Grab a pie, make a pie, tweet your #PiePledge. 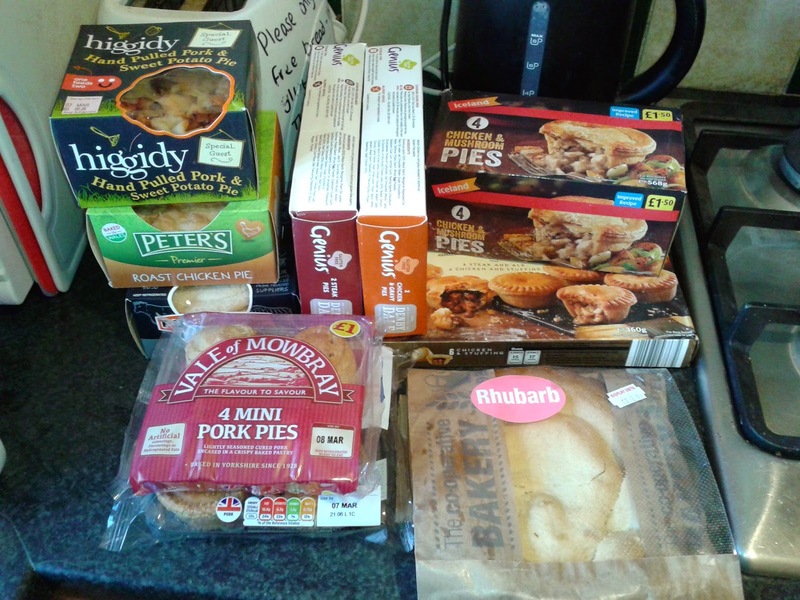 Being back at work on Thursday meant pie snacking was limited to a Mr Kipling Apple pie for breakfast, especially with two large Toppings Pies pork pies to sample for lunch! He was continuing his #Pieathon challenge, seeing how long he could just eat pies for, and by lunchtime had reached half the week eating just pies. However it had been a struggle and the option to eat some fries with his two pork pie samples from Toppings Pies proved too strong to resist. Later that evening Pierateer RAS had his first meal not encased in pastry with sausages, chips and veg. However upon getting home later in the evening he was eagerly awaiting the winner of the recent Pieminister Pie Election for supper! The "Minty Lamb" was the pie you chose from a selection of their previous pies (no longer on sale) to be brought back for the week and it rated very well indeed! The Minty Lamb pie review can be seen here, and reviews of their other two winning pies will appear soon! Day Four of the Pieathon challenge saw SJL confident of going the distance. He had already consumed 28 pies during the challenge and the mixture of sweet and savoury pies was working well. He had a breakfast of 2 Mr Kipling Apple pies, having had to start a new box having finished one already. SJL was on the train to London for work and was pleased to finally finish off his box of 12 mini Iceland party pies. Whilst they weren't great, these had provided a good option for convenient pie consumption. Now on 32 pies consumed during the challenge a long meeting in a hot room saw SJL starting to feel a bit faint. The plan had been to skip lunch as there weren't any pie options available during the meeting. However, SJL threw in the towel to avoid the risk of feeling more faint. This handed victory to Pierateer RAS in the Pieathon Challenge by just 1.5 hours. Whilst disappointed to have lost the challenge, SJL got back on the Pie consumption straight away. Having previously enjoyed Ginster's Pork Pies, SJL picked one up as a quick snack after work. Perhaps surprisingly these are quite good with a nice texture to both filling and pastry. For the evening meal SJL went for something very special. The Windmill in Mayfair is well known for producing fantastic pies but somehow is a place the Pierateers have not yet visited. Eating in the lower pie room this is a shrine to pies. The pie which takes pride of place is the award winning Steak and Kidney with posters and placemats proclaiming its significance. SJL felt that he therefore had to try the windmill Steak & Kidney. The pie was a delicious suet crust, with plenty of soft meat. The kidney flavour was present but not overpowering. The owner, Karl, came over from another pub for a chat, which was much appreciated. He certainly has a passion for pies and creating new flavours. After a lot of hard work - and obviously pie eating! - we were really pleased that fellow pie rater Martin Tarbuck finally hit the headlines and got the promotion he deserved for his pie book "The Life Of Pies". The book was featured on the Daily Mail website, alongside some great photos of Martin with lots of pies and a little video too! We were delighted to be invited to the book launch back on October 24th last year to meet the man himself, and having read the book cover to cover Pierateer SJL reviewed the book last month. Highly rated and well worth getting!